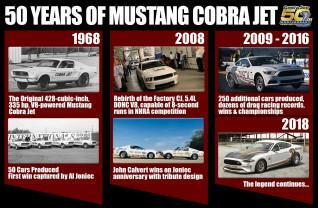 It was 50 years ago that Ford dealer and racer Bob Tasca came out with the original Mustang Cobra Jet. Now Ford has unveiled a 50th anniversary special based on the sixth-generation Mustang, and it's the fastest and most powerful Mustang drag racer ever offered by the factory. The big news is that the car is powered by a new 5.2-liter supercharged V-8. Yes, the same configuration destined for the new Mustang Shelby GT500 super muscle car. It should deliver a quarter-mile ET in the 8.0-second bracket while topping 150 mph in the Cobra Jet. Beyond the engine, the new Cobra Jet benefits from unique four-link rear suspension with drag race-specific coil-overs. There is also a Ford 9-inch solid rear axle from Strange Engineering, NHRA-certified roll cage, Racetech FIA seats, and specially designed Weld Racing wheels with 50th anniversary badging. Like previous Cobra Jets, the 2018 model has been designed to be legal for National Hot Rod Association drag racing, along with several National Mustang Racers Association and National Muscle Car Association classes. Pricing is set at $130,000 and customers can choose between Race Red or Oxford White to mimic Tasca's 1968 original. And just 68 will be built as yet another nod to the original, in this case to the car's model year. The official debut for the 2018 Ford Mustang Cobra Jet will take place during this weekend's Woodward Dream Cruise.